MMA Holdings UK enjoyed higher profits in 2010 after performance improvements at its main subsidiaries, including broker Swinton and insurer MMA Insurance. Profit after tax at the insurance group was £9.5m in 2010, up 14.6% on the £8.3m it made in 2009. This was despite a 19% drop in total income to £12.4m from £15.5m. Swinton’s profit after tax increased 14.7% to £28.2m in 2010 from £24.5m, on the back of a 2% rise in turnover to £278.1m from £271.7m. MMA said the turnover growth had been achieved both organically, through continued expansion of Swinton’s online sales channels and new products, and through its acquisition programme. Swinton’s increase in profitability came despite what MMA described as challenging market conditions. It said a lack of consumer confidence owing to the economic environment continued to affect renewal and cancellation rates, while further marketing expenditure, though positioning the company for future growth, hit short-term profitability. Insurance carrier MMA Insurance returned to profitability in 2010, making a £1.1m profit after tax compared with a £9.6m loss in 2009. The insurer’s operating result improved to a profit of £454,000 in 2010 from a loss of £24.2m in 2009. The firm added that rate increases on the home insurance account had failed to materialise, but said that the recent weather losses “have provided focus in this area”. MMA Insurance’s improved profitability came despite a 3% drop in gross written premium to £220.5m in 2010 from £227.1m. This was caused by MMA’s planned reduction of its private motor account. But the company said its property and commercial income increased by £6m, or 7% in 2010. “2011 will see particular emphasis being placed on developing commercial lines business,” it said. 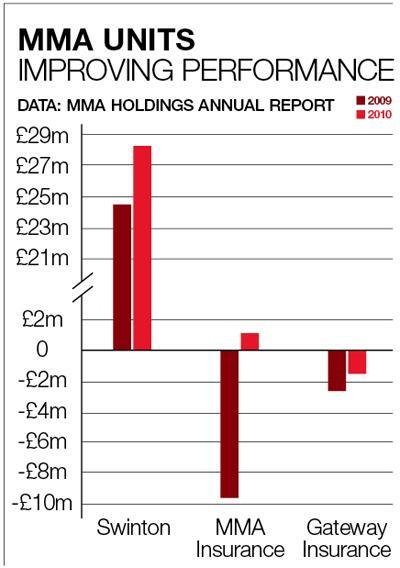 MMA Holdings UK also injected £10m of new capital into MMA Insurance on 28 April 2010. “MMA Holdings UK plc have also indicated to the board of MMA Insurance plc that it is their current intention to continue to provide necessary funding to the company for a period of at least 12 months to ensure it continues to meet its regulatory capital requirements and that it is able to pay its debts as they fall due,” MMA’s filing read. Results at Gateway Insurance Company, MMA’s Gibraltar-based motor insurer, also showed improvement in 2010, although the division still made a loss. Gateway’s total loss after tax narrowed to £1.6m from £2.6m. Following MMA’s decision to close Gateway to new business part-way through 2009, the company is now operating a renewal-only book. This caused net written premium to drop 43% to £7.8m from £13.7m. But the company attributed its improved results in part to this decision, along with rate increases and specific underwriting actions taken to reduce Gateway’s risk profile. Since the results were filed, MMA Holdings UK has bought motor insurer Provident. As revealed by Insurance Times, Provident made a 2010 loss of £6.7m, a large improvement over the £27.8m in 2009, thanks to its re-underwriting efforts.